Ryan Losi is Executive Vice President for PIASCIK, a boutique tax and financial planning CPA firm headquartered in Richmond, Virginia with offices in Beverly Hills, California. • Ryan leads the firm’s international tax practice, ensuring that all international tax clients are compliant with the Code and Regulations, as well as current tax laws. His client list spans 56 countries and six continents. His knowledge of complex international tax areas and transactions has enabled PIASCIK to serve as a CPA partner to the Commonwealth of Virginia’s economic development programs. In addition, his understanding of the unique and complex tax needs of professional athletes has enabled him to achieve a Registered Financial Advisor status with the NFL Players Association. • In leading the firm’s business development, Ryan oversees all marketing initiatives, client relationships and professional development among the firm’s employees. • Ryan is widely considered as a thought leader on taxation topics such as international business, real estate, manufacturing and healthcare. He has presented at numerous organizations and universities, including U.S. Export-Import Bank, Virginia Conference on World Trade, South Carolina International Trade Conference, Council for International Tax Executives, Medical Society of Virginia, James Madison University, Virginia State University, Virginia Economic Development Partnership and many others. • Within the community, Ryan has served or currently serves as an adjunct professor for the Executive MBA program at Virginia Commonwealth University, Vice Chair of the VSCPA Tax Committee, President, Treasurer, and/or Board Member to the Virginia International Business Council, Society of International Business Fellows and Virginia Biosciences Development Center. He is a member of the American Institute of Certified Public Accountants and the Virginia Society of Certified Public Accountants. 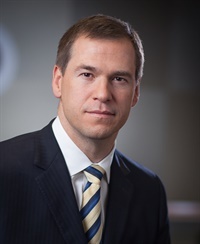 • Prior to joining PIASCIK, Ryan served on National Tax Teams with the “Big Four” international accounting firms of PricewaterhouseCoopers LLP, and KPMG LLP. He holds a BS in Accounting from Virginia Commonwealth University.